T-Mobile MVNO and global roaming SIM operator Lycamobile US has updated their Website with new plans. The lineup jumps from three monthly plans, with two available international add-ons, to eight plans. There are now four "Unlimited National Plans" and four "Unlimited International Plans". Lycamobile's popular pay as you go plan seems to have disappeared from the site. I suspect pay as you go may not actually gone. In the past, when you activated a Lycamobile SIM you were automatically on pay as you go, unless you activated a monthly plan. Hopefully, for PAYGO fans, it still works that way. Lyca's often clueless customer support reportedly told one customer today that pay as you go is still available. I've emailed Lyca asking for confirmation and will update the post with their reply. Update 7/21: Lycamobile never replied to my email. When I called Lycamobile, I was told by a customer support representative that pay as you go was not going away but that the price for calls was going up from 2¢/min to 5¢/min and that data would no longer be available on pay as you go. These changes apparently haven't gone into effect yet as Lycamobile users report that they are still being charged 2¢/minute for calls and that data still works. All the new plans include data at "up to 4G LTE speed". I'm not sure if that means actual LTE or not or just speeds as fast as slow LTE. LTE was supposed to be one of the features of the new Lycamobile "Plus" plans that were announced to Lycamobile dealers last month as "coming soon". However, there's no mention on the site of the other features that the "Plus" plans were supposed to have which were; MMS Picture Messaging, nationwide area codes and the ability to use locked T-Mobile phones. Using locked T-Mobile phones would require new SIMs' A Howard Forums user reported recieving a text from Lyca today saying "Great News! The Lycamobile Plus plans have arrived. 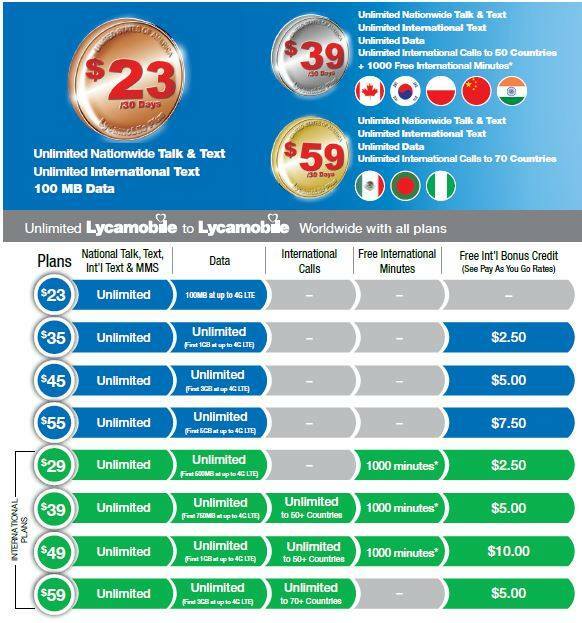 To get your Lycamobile Plus plan, swap your sim @ lycamobile.com or your local retailer" so maybe a new SIM will enable MMS and locked phone compatibility. However, Lycamobile's data settings page hasn't changed and still doesn't list a MMSC, which is required for MMS to work. It's also still possible to switch to or activate one of the new plans with an old SIM. Whether it's "Plus" or not, the new plans are very competitive. 1 Balance never expires provided an outgoing call is made, data is used or a text message sent at least every 90 days. Minimum top up is $10. 2 Incoming texts are free. Just keep in mind that Lyca's plan are NEVER grandfathered, so if they decide to do changes to their plans (and they will) you have to take it or shake it. Oh yes....they are very good at "Subject to change without notice" and you have to change along with it. It is a roulette game that you go along for the ride. The "keep in mind" crowd is wrong again. Lyca's original pay as you go plan is still charging the old rates. That is what I call grandfathered. I am even getting a bonus. I have not been charged for any sms sent since last August. Including one I sent two days ago that went through. The pic on this page shows "National Talk, Text, Int'l Text & MMS" It's in between Plans and Data. 3. Once when switched to new SIM, we should no longer "roam" on T-M, that is to say no more "R" on the signal bar. 4. Call CS to request a free NEW sim. That will be free for old Lyca users. These two international plans the $39 750MB plan and the $49 1GB plan have a difference of only 250MB for $10 more. Is this right? That's what the Lycamobile site shows. Also the $49 plan has a $10 international call credit ve $5 for the $39. The picture shows that MMS is included. Does anyone know if existing customers have to pay shipping when requesting a new Sim for the plus plan? They told me free shipping for the New SIM, but they also told me if you have an existing account not to activate on line, but to call them in order to properly transfer over your service and balance, etc. Is the $29 plan with 1000 international minutes also limited to 5 international numbers per month? Probably, the Lyca site doesn't provide any details about that plan but I think it's probably 1000 minutes to the same 50 countries and 5 numbers as the unlimited international calling on the $39 and $49 plans. My girlfriend and I have the $16 national plans, only 250 minutes but calls to each other are free and unlimited texts , I disabled the data on the phones, only use it within range of a wifi connection. Questions: anyone know if the $16 national plan will still be offered or should I start looking. Also, on the $23 plan, if they are making the move to a traditional tmobile MVNO, will the phones now "roam" over to ATT when tmobile signal not present. Lyca told me that if you add autopay you will be grandfathered into the $16 plan. Best to call to set that up. Posted on HoFo, it appears going forward that PayGo will no longer have access to data, Talk and Text only? Remains to be seen though, data is still functioning on my balance, but so are 2c calls when it has been published as 5c.??? The lowest unlimited talk and text plan with data is still Cricket group plan: 500 mb and five lines are $22 each. That is assuming you can get 5 people and they all want to split the plan evenly. Two questions --Would this global roaming SIM also let you roam in the U.S.? and are any taxes and/or fees extra? A little confuse with their web page on this, one statement says no hidden fees and another states regulatory fee and taxes will be collected. In the US, Lycamobile only uses T-Mobile, the old SIMs could roam also roam internationally but the international roaming rates were much higher than Truphone in most countries. If you refill online there are no taxes or fees. Local Lycamobile dealers are required to charge applicable state and local sales taxes and e911 fees. In the US Lycamobile only uses T-Mobile. They have never supported roaming on AT&T or any other US operator. Not with the old SIMs and not with the new SIMs. What speeds are you throttled after highspeed data ? Lycamobile isn't saying but throttled speeds on other T-Mobile MVNOs are generally 128 Kbps. You can. But if you mean are calls to cellphones included in the 1000 free minutes, I believe cellphones are included in the same countries as with the $39 plan as listed on the Lycamobile site. For other countries you can call cellphones but you will be charged per minute rates. The unlimited international calls to the first 5 unique numbers on the old 29 plan appears to be only for 5 Lyca numbers. Granted, this was Lycamobile CS, but when I was chatting with them today I was told that MMS was only for "unlimited" data plans, not the $23 100-MB plan. It seemed odd, but he repeated it. So any hopes of MMS texts coming to paygo seem to be dashed. Plus it makes the $23 plan a little less attractive. Rate of 5¢ per minute for all calls made from or received in the US. Surcharge applied for calls made from the US to international destinations - to determine total rate (5ct/min surcharge + country rate/min) per destination, use International Rate Finder here. US includes 50 states and Puerto Rico. Roaming surcharges apply for usage from outside the US. Data streamed at up to 4G LTE speeds. For non-commercial, personal use only. SIM and assigned number expire after 90 days of non-use. Plans, rates & services are subject to change without notice & are not available in all locations or for all phones. Where did the image above come from? Go to Lycamobile website and scroll all the way down, look at "Tariffs" and click on pay as you go and you will get the plans page, look under the international recharge plan and you will see terms and conditions , click on that and you will get the details. No longer a good deal for light users. Going back to pageplus or even try truphone for now. "Still working on updating website" is still the line. They are probably not trying to get into legal problems like Apple did with in app purchase. Will stay with them if those things are true. So far I haven't heard of anyone losing data access or paying more than 2¢/min on Lycamobile pay as you go. Did they increased the text rate from 4 cents to 5 cents? Are incoming texts still free? No and I haven't seen any evidence of a text rate increase or the end of free incoming texts. I don't consider Lycamobile's customer support a very reliable or accurate source of information either. But Lycamobile has a history of raising rates with little or no warning. If rate changes actually happen they will be covered here. Anyone here use up all their LTE data? What are you then throttled to afterwards? A HoFo user confirmed that head using a PLUS Sim and was able to send and receive mms. Callingmart shows refills are with 90 day expiration. And forum users are showing the same. And lyca has some long cryptic message on the pay as you go plan. Bottom line: no expiration pay as you go is over. We are leaving Lyca. Not very trust worthy. Does that mean mandatory expiration in 90 days or 90 days from last use / transaction date? I have my son on an old flip phone on Lyca. Started him off with $20 bucks about 3+ months ago and so far it is going ok. Sometimes though the phone stops showing Lycamobile on the screen and needs to be rebooted to pick up the network again. Other than this pain it seems to be fine. Rate of 1¢ per minute only applies with purchase of a Plan. Without Plan, rate is 5¢ per minute for all calls made from or received in the US. Surcharge applied for calls made from the US to international destinations - to determine total rate (5¢/min rate + country rate/min surcharge) per destination, use International Rate Finder www.lycamobile.us/en/internationalrates . US includes 50 states and Puerto Rico. Roaming surcharges apply for usage from outside the US. 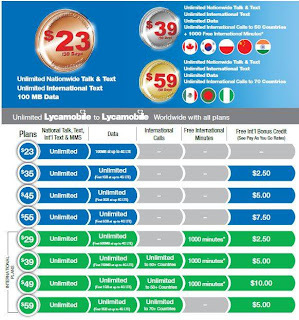 Offer of unlimited international calls to Lycamobile numbers only valid with purchase of a Plan and when both numbers are not roaming. For non-commercial, personal use only. SIM and assigned number expire after 90 days of non-use. Plans, rates & services are subject to change without notice & are not available in all locations or for all phones. Auto Renewal Discount is 9% on All Plans. This is still a great deal people. Lyca has an auto pay discount now? Can anyone tell me what lte bands does lyca support?? What is the expiration for paygo in practice? How can you tell if a sim card is plus or classic? Only Plus SIMs work in locked Tmobile phones. Pay-go (technically, the International Recharge add-on, I think) funds never expire so long as you make a chargeable call or text every 90 days. Not likely you can activate an old SIM these days.